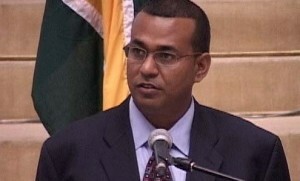 Minister of Natural Resources and Environment, Robert Persaud. The Guyana Gold and Diamond Miners Association (GGDMA) is projecting a historic gold production target of 500,000 ounces for 2013 and it is President Donald Ramotar’s hope that the benchmark is reached. The target seems within reach as gold declaration up to late Saturday was in excess of 310,000 ounces and a report presented by Minister of Natural Resources and the Environment Robert Persaud revealed that the quantity of gold declared for the first half of this year increased by 23.23 percent over the quantity declared for last year. Gold maintained its reputation as the biggest producer in the mining sector for last year, with a production value in excess of $137B and accounting for 78.2 percent of total value of mining output. But given the finite nature of mineral resources, continued and sustained development of the mining sector comes into question. Here President Ramotar expressed the need for partnerships and value-added mining practices to eliminate corrupt and criminal practices such as bribery. During the official opening of Mining Week and Award Ceremony at the Guyana International Conference Centre (GICC) yesterday, the Head of State conveyed his best wishes to the sector that has over the years been a major contributor to the country’s Gross Domestic Product (GDP) and a main source of job creation. In his list of recommendations, President Ramotar envisaged a high quality jewellery sector and for bauxite, a smelting plant for aluimina/aluminum but in the absence of cheap energy the possibility of these investments seems impractical. “That is one of the reasons this issue with the hydropower is such a painful issue… we cannot go to higher levels and achieve standards of living comparable to developed countries unless we have new infrastructure and cheap energy; hydropower is indeed one such area… it can give us the possibility of smelting bauxite and doing other things,” President Ramotar said. Several of the major stakeholders in the mining sector like Reunion Manganese, Bosai Minerals Group and Sandsprings Resources have however, already been considering alternative renewable energy sources. In wake of the recent fall in gold prices below the key $1300 an ounce mark, a concerned GGDMA has appealed for miners in the local sector to take precautionary measures by paying attention to cost reduction and to improve efficiency. The association headed by Patrick Harding also wants support from the Government through the Ministry of Natural Resources and the Environment, chief among which is fiscal concessions. “We (GGDMA) have been asking for a few concessions down the line and only last week we met with our President Mr. Ramotar, and we had a very healthy meeting and we hoping for good results… but this year we are hoping to top production of 500,000 ounces of gold which has never been achieved in Guyana in the history of gold,” Charles Da Silva Vice-President of the GGDMA said in his remarks.